It has no menue and no taskbar. So it is ideal for "kicker", the KDE-Panel. Or you use wxB-menue and fbpanel. Install the oroborus-Dotpup, and if you like, the themes. Then exit X and run "xwin startoroborus". 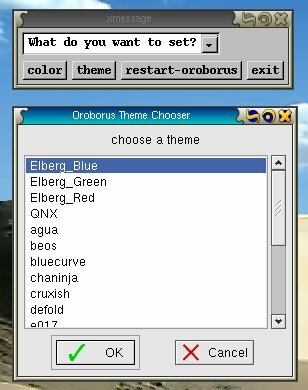 To customize oroborus, edit /root/.oroborusrc (if you have NO themes installed) or /root/.oroborusrc-personal (if you DO have themes installed). You might need the reboot-roxapp to be able to exit Puppy. Or install the attached "deskmenu". You can add the command "deskmenu&" to /root/.xinitrc to launch it with X. This is even better than using openbox. WOW !! I used it for an own Desktop I was working on. It also has a very clear sourcecode, so i was able to patch it for my needs, even though I am no good C-coder at all. Maybe we need a small customization for kicker, to be able to exit Puppy without the reboot-roxapp or the menue mentioned on the oroborus-homepage. Well the fbpanel menu is a mess, so good luck with that. and fbpanel. Eats less resources = better performance. dock apps are not docked with kicker they keep floating on the desktop. I also tried using kdetrayproxy app dose not work with that either. try to run rox without the -o option. >dock apps are not docked with kicker they keep floating on the desktop. I also tried using kdetrayproxy app dose not work with that either. But i started kicker from a console, maybe that has an effect? Will have to test it more. Strange too.. tried to run it from wxB-menue, from rxvt, from xfe, from rox. I added "deskmenu" to the first message. Maybe the KDE-problems depend on how you start it. What ROX-version do you use? i still use the old one. changed that in the script. now running fine. I updated the themes-dotpup with a corrected version. How do I start this thing ? Another thing, When this issue is resolved. 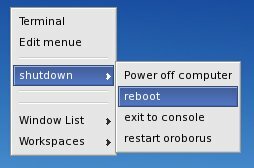 How would I start orborus & fbpanel at the same time ? Hi Mark and who else is involved. Posted: Fri 18 Nov 2005, 07:01 Post subject: I coudn't wait... missing lib! Thanks. Found it also in xorg682c.pup ..
Posted: Fri 18 Nov 2005, 09:22 Post subject: deskmenu diesn't work? But then on right click I get rox..? left+middle click nothing..? a HUGE amount of libs..! Next will see how fbpanel get along.